Suzuki and his Bach Collegium Japan commenced their complete Johann Sebastian Bach sacred cantata cycle for BIS in 1995. Suzuki is now on the home-stretch having reached volume 45. For those unfamiliar with the Bach Collegium Japan, they are a choir and orchestra founded in 1990 by their director and keyboard player Masaaki Suzuki. Here Suzuki has a choir of eighteen SATB singers including six soloists. The orchestra are renowned as Japan’s leading period instrument ensemble applying their knowledge of historically informed performances of sacred baroque music and specialising in the work of J.S. Bach. Their chosen venue has been the Shoin Women’s University Chapel in Kobe, Japan. Full details of the instrumentation and singers for each score is provided in the excellent booklet notes. Bach wrote approaching two hundred cantatas for liturgical use. They were almost always intended for a specific feast or function in the Lutheran church calendar. Compared to the large number of sacred cantatas Bach’s six Motets form a far smaller grouping but they are no less important. Much academic research has gone into discovering their intended purpose. It is generally acknowledged that they were written mainly for funeral services. It seems that only the motet Der Geist hilft unser Schwachheit auf, BWV 226 is definitely known to have been used for a funeral; specifically at the burial of Johann Heinrich Ernesti. The score Lobet den Herrn alle Heiden, BWV 230 is traditionally included in the group of six although its Bach attribution is a cause of doubt. In addition to the six Motets, BWV 225-230 we hear on the BIS disc the sacred choral works: BWV Anh.159 and BWV 118. 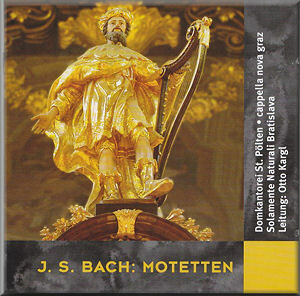 On the other disc, ORF include only five of the group of six Bach Motets omitting the questionable Lobet den Herrn alle Heiden, BWV 230. ORF’s Otto Kargl uses two choirs and he tells us that there are eighteen singers in each. In the double choir Motets the Domkantorei St. Pölten is placed on the right side and the Cappella Nova Graz on the left. The Solamente Naturali (Simply Natural) Bratislava play on period instruments. Specialising in baroque music the Slovakian ensemble was founded in 1995. Details of the specific instrumentations are not given in the booklet notes but I have established that Kargl’s basso continuo is a chamber organ and double-bass. The origin of much of Bach’s prodigious compositional output is frequently difficult to unravel and his Motets are no exception. They are occasional works that he would compose to commissions for specific events. Following a death a mourner might select their own specific Bible passage as the basis of a Motet to be sung at the funeral service. Owing to the time constraints of the forthcoming burial it is likely that Bach would have had to work extremely quickly with little time for rehearsal. For double mixed choir the three movement motet Singet dem Herrn ein neues Lied (Sing unto the Lord a new song), BWV 225 was composed around 1726/27. Most likely intended for a funeral service it is possible that it may have been for a feast day such as Christmas or Easter. Here in the manner of BWV 226 Suzuki has placed strings with the first choir and woodwind with the second. Organ and bass serve as the basso continuo. Suzuki states that this is his favourite Bach Motet and it is wonderfully performed with obvious devotional respect throughout. I especially enjoyed Suzuki’s immaculate performance of the opening Singet dem Herrn ein neues Lied. Also gloriously rendered is the substantial final movement psalm setting Lobet den Herrn in seinen Taten (Praise the Lord for his mighty deeds) - a four-part fugue. In Singet dem Herrn ein neues Lied Kargl and his two choirs impress in the central movement chorale Wie sich ein Vater erbarmet (As a father feels pity) coming across as warmly enthusiastic and dedicated. The motet Der Geist hilft unser Schwachheit auf (Likewise the spirit also helpeth our infirmities), BWV 226 is the only Motet of which a reasonable amount of information is known. It was written in 1729 for the funeral of Johann Heinrich Ernesti who was rector of the St. Thomas School, Leipzig. This is a three movement score for double mixed choir and Suzuki has placed strings with the first choir and woodwind with the second. Organ and bass are the basso continuo. In the movement Der aber die Herzen forschet (Yet he searcheth the hearts) - a complex four-voiced double fugue - I particularly enjoyed Kargl’s chorus who sing with ease and enthusiastic dedication. Little is known about the Motet, Komm, Jesu, komm! (Come, Jesus come), BWV 229. For double mixed chorus the score was probably written before 1733. A true highlight of all the Motets is the quite superb performance of the title track Komm, Jesu, komm! BWV 229. Suzuki’s choir sings with great craft and precision but never lack humanity. In the same movement Kargl’s choral forces are also on fine form singing splendidly with a rapt tenderness. Thought to have been written prior to 1735 Jesu, meine Freude, (Jesus, my joy), BWV 227 is a substantial five-part motet cast in eleven movements. Considered by many judges to be one of Bach’s greatest Motets, influential musicologist Donald Francis Tovey has singled out the chorus Gute Nacht, o Wesen (Good night, O life) for special praise. It was for many years thought to have been intended for the funeral service of Johann Maria Keeys but this is now the subject of continuing dispute. At the heart of the score is the five-part fugue Ihr aber seid nicht fleischlich (But ye are not in the flesh). I was struck by how the considerable technical and interpretative challenges are overcome by the Bach Collegium Japan and always with accomplishment and radiant expression. In a single movement Lobet den Herrn alle Heiden (O praise the Lord, all ye nations), BWV 230 is a four part Motet that has had its attribution to Bach questioned. It was written after 1730 possibly for a funeral service. Another single movement motet for double mixed choir is Ich lasse dich nicht, du Segnest mich denn, (I will not let thee go), BWV Anh. 159. Probably intended for a funeral service the score was partially written by Bach and also by one of his pupils. The one movement motet Fürchte dich nicht, Ich bin bie dir, (Fear ye not, for I am with thee), BWV 228 is scored for double mixed choir. There have been long associations with the funeral service of Frau Susanna Sophia Winckler in 1726 but this is now doubtful. It may have been composed earlier around 1708-17. Suzuki has again made the decision to place strings with the first choir and woodwind with the second. Organ and bass are the basso continuo. Cast in a single movement the motet O Jesu Christ, mein’s Lebens Licht (O Jesus Christ, light of my life), BWV 118 requires a four voice choir and an instrumental ensemble that not only reinforces the singing but is also used independently. The orchestral playing from Suzuki’s players especially in the instrumental introduction is exquisite. When the choir joins at 0:51 a truly remarkable and inspiring effect is achieved. Suzuki and his Bach Collegium Japan give wonderful accounts of these Motets that are as impressive as I have heard from any specialist performers on the early music scene today. One is unlikely to hear finer and more disciplined yet affectionate singing. I was especially impressed with their vividly clear and unfailingly precise tones combined with a sense of vitality and reverential expression. Most of all the unity of the chorus is remarkable. Suzuki’s period instrumentalists deliver fresh, clear and colourful support. After working on a considerable number of volumes for Suzuki the BIS engineers certainly know the Kobe Shoin Women’s University Chapel inside out and aptly demonstrate their expertise with excellent sonics. The sound is clear and detailed whilst leaving ambience together with a superb balance. I played the hybrid SACD on my standard players. Throughout Otto Kargl’s enjoyable performances I was struck by the splendid singing of his two choruses: enthusiastic, committed and pleasingly in unison. Closely recorded in the warm reverberant acoustic of the St. Pölten Cathedral the congested sound is noticeable. Although the ear does become accustomed to the sonics to a degree I felt I was not hearing Kargl’s singers and period instrument players to anything like their best advantage. In the balance the choruses dominate and it is hard to pick out individual instruments from the custardy mass of sound. Again I played this hybrid SACD on my standard players. 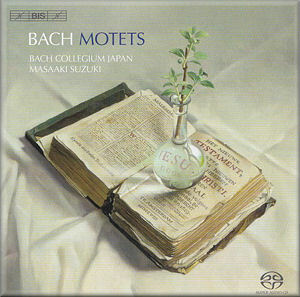 Rubbing shoulders with these wonderful 2009 accounts from Suzuki there are two alternative versions of the six Bach Motets that I especially admire for their conscientious detail and expressive humanity. There is the recording from The Sixteen directed by Harry Christophers who recorded the Motets at the All Hallows Church, London in 1989. A particular favourite of mine is the award winning release by Philippe Herreweghe directing La Chapelle Royale and the Collegium Vocale on Harmonia Mundi. Recorded in 1985 at L'Église St Gilles, Bruges, Belgium, I was greatly impressed by Herreweghe’s well-balanced and clear sound quality.